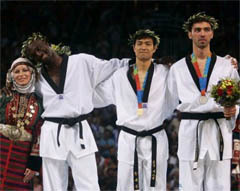 (L-R) Pascal Gentil of France (bronze), Dae Sung Moon of Korea (Gold) and Alexandros Nikolaidis of Greece (silver) receive their medals for the men's over 80 kg Taekwondo event on Aug. 29, 2004. ATHENS, Greece — Korea and China clinched one more gold medal each in the taekwondo competition here on Aug. 29, 2004, the final day of the 2004 Athens Olympic Games. Korea's Moon Dae-sung required only two minutes and 10 seconds to knock out Greek Alexandros Nikolaidis to grab the gold medal in the men's over 80kg category. Moon's gold helped his country increase the number of gold medals in taewkwondo to two, thereby helping his country rank among the top 10 in the gold medal tally. Moon advanced to the finals by outpointing France's Pascal Gentil 5-3 in the semifinals. Gentil, the bronze medalist at the 2000 Sydney Olympics in the same weight division, won the bronze medal in the division when he brushed aside the stiff challenge from Jordan's Ibrahim Kamal on points 6-2 in the repechage final. Zhong Chen of China celebrates after defeating Myriam Baverel of France during the women's over 67 kg Taekwondo gold medal match on Aug. 29, 2004. In the women's over 67kg final, China's Chen Zhong crushed French Myriam Baverel on points 12-5 to earn her country the second gold medal in taekwondo. The bronze medal in the women's class went to Venezuela's Adriana Carmona when she beat Brazilian Natalia Silva on points 7-4 in the repechage final. In terms of the number of medals, Chinese Taipei outranked others as it captured two gold medals and one silver, followed by Korea with a haul of two golds and two bronzes, and China with two gold medals. The United States won one gold and one silver and Iran garnered one gold and one bronze in taekwondo. Greece earned two silver medals in the sport. Taekwondo, a traditional Korean martial art, debuted as an Olympic sport at the 2000 Sydney Olympics. It was a demonstration sport at the 1988 Seoul and 1992 Barcelona Olympics. Taekwondo, which boasts a worldwide membership of 176 countries and practitioners of about 50 million around the world, is scheduled to be conducted as a medal sport at the 2008 Beijing Asian Games.